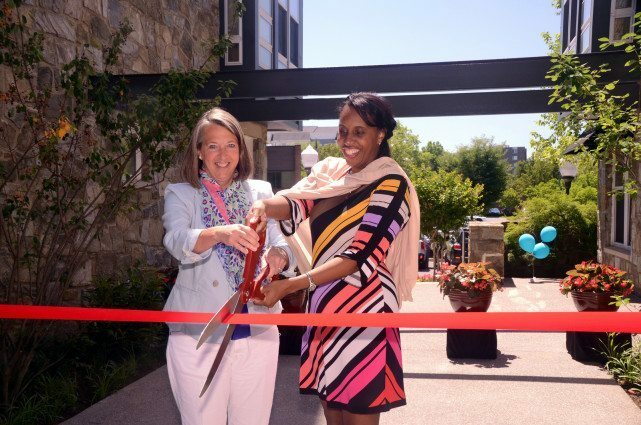 Mayor of Rockville, Bridget Donnell Newton, and Robin McBride, Vice President, Mid-Atlantic Region Chief Operating Officer for Federal Realty Investment Trust officially marked the unveiling of the newly designed amenity spaces and other completed renovations. The new amenities include an indoor/outdoor cafe area, new swimming pool and lounge area, refreshed amenity spaces, as well as upgrades to apartment interiors and updated patios for select apartments. The occasion was celebrated with a ribbon-cutting ceremony, which took place on Friday, June 6, 2014.